Tour Operator theme is an absolutely unique theme concept. 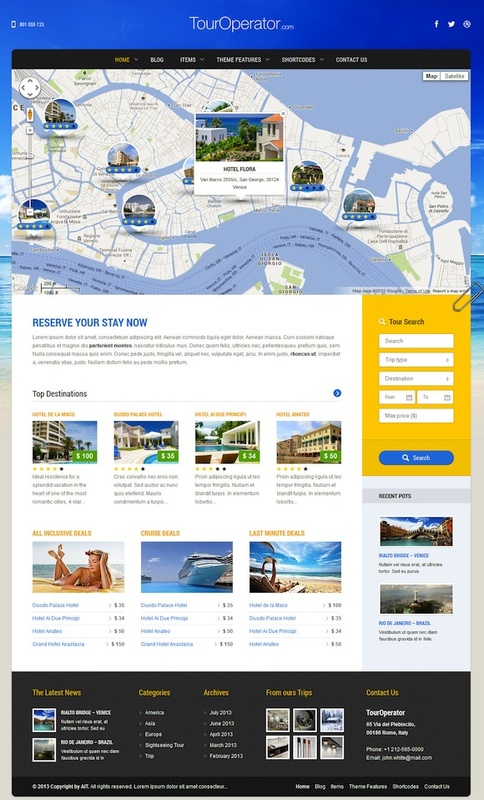 You can use the theme to set up powerful website for tour operator agency, hotel resorts, guesthouses, B&Bs, campsites or any other businesses that require reservations. Guests are able to search their trip or stay via detailed search box and see availability and prices right away. After they select required package, they can send a reservation via the website. Reservation information is stored in the database and it’s also sent to hotel’s email address. Features include geolocation support, room availability, room price structures, built in spaces for advertising, you can easily include your Google adsense or any other ads, custom built search and filter, star rating system, customer reviews, Google Maps integrated, image slider and more.